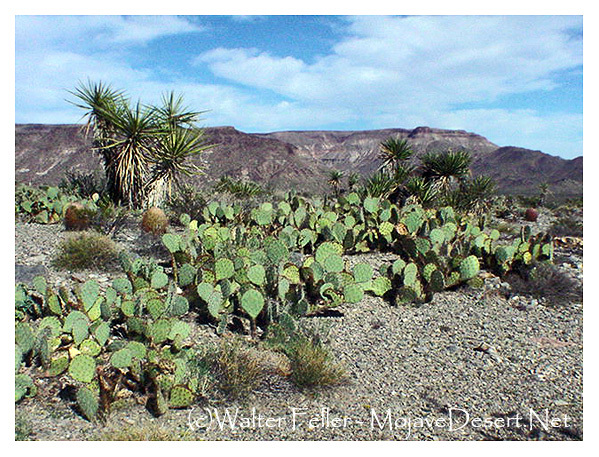 Cactus, or mixed desert scrub includes the popular notion of "desert." Barrel cactus are prominent on south-facing slopes. They germinate only in years with favorable rainfall, so barrel cacti growing near one another are usually of the same age. If you visit the Mojave in spring you may witness these desert cacti in beautiful bloom. The greenish-gray Mojave rattlesnake blends in easily with this habitat. Aggressive and highly venomous, it is one of the few dangerous animals in the desert. This snake is most active at night and in the early morning but be careful where you place your hands and feet at all times. Early morning is also a good time to spot a Gambel's quail feeding on cactus seeds and berries. These birds nest in abandoned nests of roadrunners, thrashers, and cactus wrens. Discarded limbs or the tree's toppled body provide homes for the yucca night lizard and termites. ..